Looking for Honda cars with a distinctly sporty look? The Honda Accord is your best choice. The Honda Accord capitalises on the relaxed luxury of its predecessor. Inside, the latest in technology puts you in command, while highly evolved safety features help you monitor your drive – and the world around you. And that’s all to start. 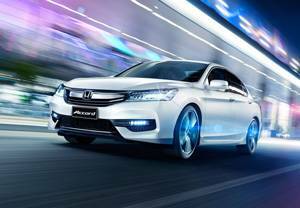 With so many features, details, pleasant surprises, ‘thought-of-thats’ and more, you’ll quickly see why the new-look Accord truly has it all. So, what are you waiting for? Book a test drive or enquire now with Trivett Honda Parramatta in Parramatta through our Service department online.